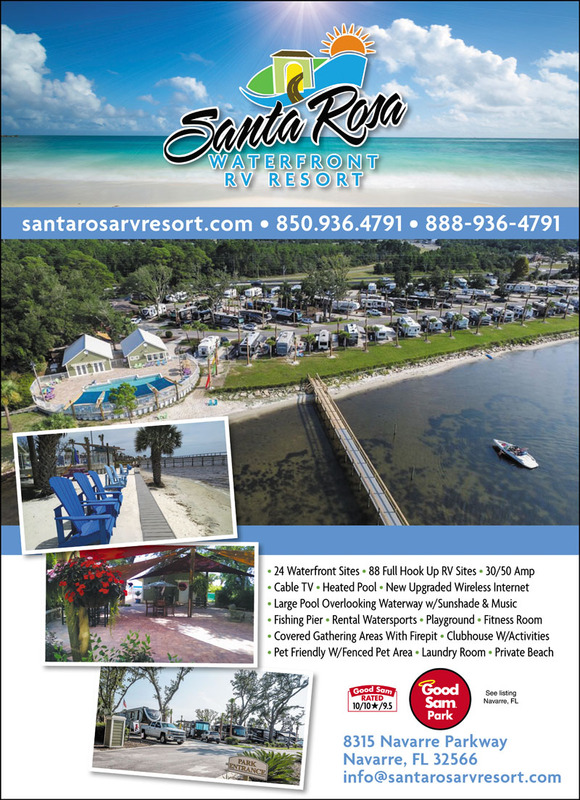 If you are seeking a true resort experience, look no further than Santa Rosa RV Resort. An exclusive resort awaits your arrival. Waterfront views, WIFI, Cable TV, big rig and pet friendly. Pool and fitness room on site. This resort is first class all the way! Beautifully maintained; sparkling clean grounds, pool and facilities. Owner patrolled frequently! Laundry facilities are great. All concrete pads among beautifully landscaped and maintained grounds. Wonderful staff and very nice friendly fellow "campers". Beautiful big rigs everywhere! Great activity schedule. The fenced dog park was wonderful--shaded with seating for dog parents. Can't wait to book again! This RV park is very nice! All the roads are paved and the sites are level and concrete! There is a pool but no hot tub. There is a beach area but it's not nearly as nice as shown in the promotional pictures. The dog park is adequate but it's not lighted. For a park this big there are a very small number of bathrooms but they were nice and clean. Check-in was a breeze and the office staff are extremely helpful and pleasant. If you need internet, forget it! It's horrendous!! A resort this nice should invest in better internet. We tried contacting their service provider but it was Memorial weekend so we got absolutely no help. Jinks tried to help but to no avail. There is a Publix and a Walmart very close by. Cross the bridge and you're at Navarre Beach. Excellent park and location. Restrooms and showers were super clean. Park was very well organized. Staff was excellent! Sites, especially along the waterfront can be tough to back into because access road is a bit narrow. Be patient! Location was easy to access even though it is along a very busy road. A short drive (30 minutes) from Pensacola Beach area and great seafood place called Peg Leg Pete's. The park is absolutely beautiful...The staff is awesome ?? And the view is amazing! 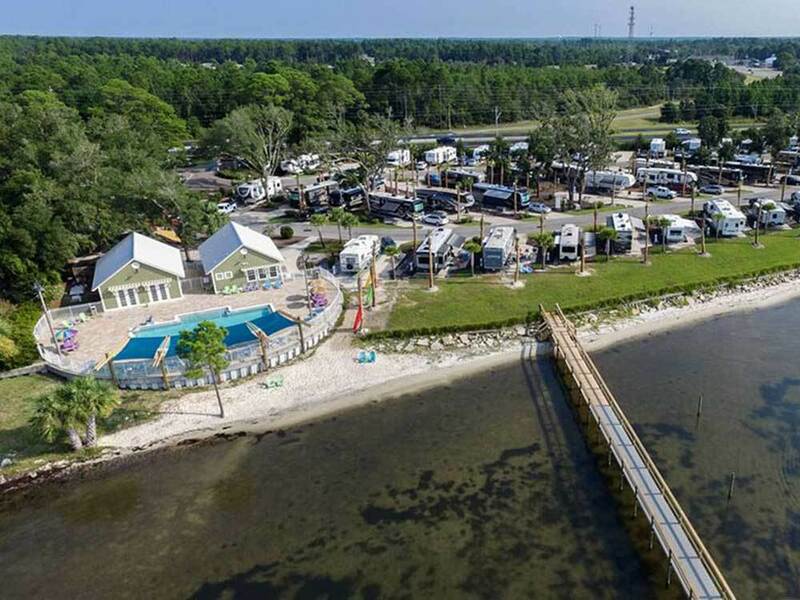 This is a very well maintained campground with unbelievable views of the gulf coast. We went paddle boarding in the ocean, which my son really loved. We also spent a lot of time in the pool which has an awesome view. All of the lots had concrete pads and full hookups, which is always nice. The only disappointing thing was the kid's playground, which was a old small swing-set pushed off in the back corner. Great place to stay. Super nice, better than most. Really nice sites, some on the sound. Publix nearby, easy access. Pricey, but would pay to stay again. What the newest owner has done with this facility is awesome. In the past four years they have added a pool, updated the restrooms, created a beautiful community outdoor sitting area with tables and a firepit and the small beach area is just right. They have large cement sites with all the amenities needed. They have kayak and Yolo rentals. It's convenient to a grocery store and other areas such as Navarre Beach just across the bridge. I will definitely make this a place to revisit. This resort is very clean, with a beautiful pool & easy access to the beach. However, when we checked in the manager was very rude to us. In talking to other RV residents, we were told that was just the way she is, so we didn’t really give it another thought. Our visit was very nice so we thought we would book for next winter. We never reserve that far in advance without asking about the refund policy & the manager told us there was a $200 FULLY REFUNDABLE deposit if requested before 30 days. About a month later, we decided to change our plans and cancelled the reservation 11 months early so that the site could become available to another guest. When I called to cancel, the manager informed me that there WAS a $25 cancellation fee. Surprise. That was not indicated on the receipt that was e-mailed to us after we gave the deposit or by the cancellation policy on the web site which is poorly worded at best. We did receive the $175 (less $25),... not a big deal , but we feel like we were mislead...Not the kind of person one would want to encounter after a long day on the road.. We also requested the owners name so we could report the incident directly , but we haven't received that yet. Great campground, friendly folks (staff & neighbors), very clean. Never could get connected to the Wi-Fi, some issue with Apple products I guess?? Great location. Nice pool overlooking the sound. Short bike ride or drive to Navarre Beach. Entrance a little hard to see from 98 east. Looks like you are turning in to Real Estate company, but grocery store and places to eat all within 1/4 mile. Will definitely go back. Great park- we love the location and the amenities. The new owner is working on making the park even better than it already is.